Yeast is a small microorganism that causes the rising of bread and fermentation of beer and wine. As it is a living organism the success of a particular food item may be dependent on the ability of the yeast to tolerate the ingredients. Working off observations from various "panarian" pursuits, Scientific AmeriKen has noticed decreased rise out of breads containing garlic. In order to confirm that garlic is toxic to yeast and explore such potential in other ingredients, Scientific AmeriKen will conduct experiments to assess CO2 production of yeast in the presence of various ingredients. TOur observations that breads containing garlic do not rise as well led us to hypothesize that garlic inhibits yeast CO2 production. However, breads containing cumin, cinnamon, cayenne pepper or ginger have never been attempted giving no insight on their effect on yeast. Similar to garlic, cinnamon, cumin and cayenne pepper each have anti-microbial affects, thus it is hypothesized these spices will inhibit CO2 production as well and ginger will not. Needed for this experiment: Balloons, flour, sugar, water, yeast, garlic powder, cumin, cinnamon powder, cayenne pepper, ginger powder, and bleach. A funnel is also recommended. To start each balloon was filled with 1 tablespoon (tbsp) flour, ½ teaspoon (tsp) sugar, ¼ tsp yeast, and ½ tsp of each experimental compound. Bleach was also included as a control to demonstrate no growth. Each balloon was then filled with ½ tbsp water (we recommended 1 tbsp for future experiments), tied, shaken, and then placed in the sun. Photographs were taken every 10 minutes. At 30 minutes the width of the balloon was measured with Adobe Photoshop™ to quantify relative growth. Outside temperature was about 90F during the experiment. Photographs were taken every 10 minutes and shown in the figure below. CO2 production of yeast was very noticeable compared to controls, although after 30 minutes the bleach control showed some production. After 30 minutes a final photograph was taken and analyzed with Adobe photoshop. 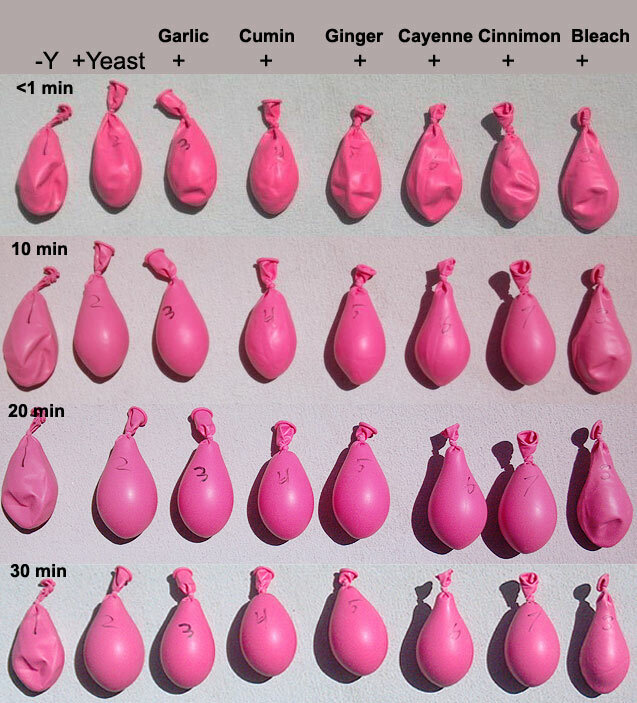 Pixel width of the balloons was assessed, normalized against the size of the yeast balloon at time 0, and then growth was compared relative to yeast only, figure shown below. It is apparent from the data that garlic indeed slowed CO2 production of the yeast. This effect was also seen with cayenne and cinnamon - two compounds said to have anti-microbial effects (ref). 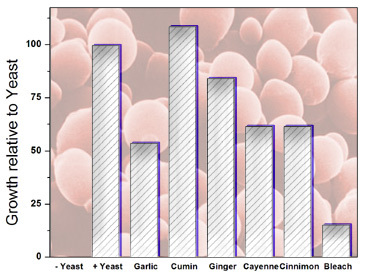 Although cumin is also said to have some anti-microbial effects it had no inhibition on yeast in this experiment. Future research in this area will take place in the field as these ingredients will be used for different breads. Whether adding more sugar or more yeast will compensate the inhibitory effects of garlic, cinnamon and cayenne pepper is yet to be seen as is if the bread will be edible after adding these ingredients.